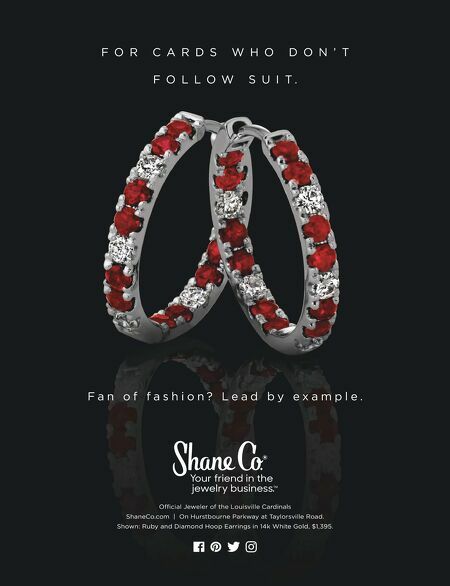 W I N T E R / S P R I N G 2 0 1 7 U O F L M A G A Z I N E | 4 7 F O R C A R D S W H O D O N ' T F O L L O W S U I T . Official Jeweler of the Louisville Cardinals ShaneCo.com | On Hurstbourne Parkway at Taylorsville Road. Shown: Ruby and Diamond Hoop Earrings in 14k White Gold, $1,395. F a n o f f a s h i o n ? L e a d b y e x a m p l e .